Modern Comfort, Pampering Spa Experience & Great Views of the Central Valley. Only a 45-minute drive from San Jose International Airport, Xandari Resort and Spa offers an ideal mix of luxury and convenience in the Costa Rican Central Valley. The combination of art, architecture, and warm service make Xandari great option for couples, birdwatchers, artists, and groups looking to relax, be pampered, and have access to light activities on site. 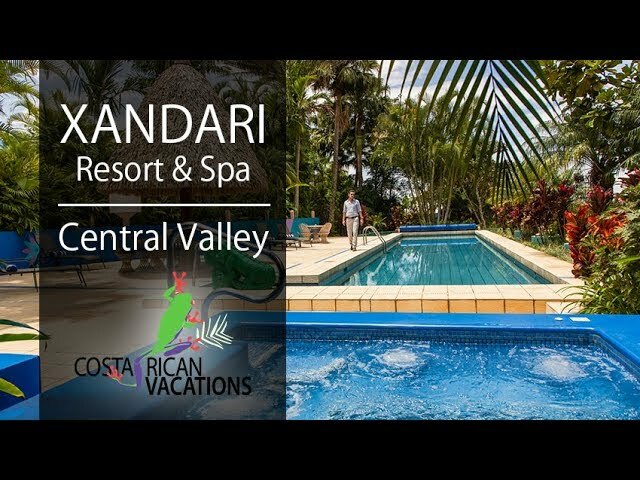 Xandari offers 24 villas set along 40 acres of lush forest overlooking the Central Valley. Each villa was uniquely designed with vibrant-colored walls and funky furnishings. Standard room amenities include a safe, hairdryer, coffeemaker, mini-fridge, and furnished balcony with sweeping views of the Central Valley! Complimentary WiFi and a television are available in the main building/restaurant area of the hotel. But trust us: with views like these, you won’t even feel like watching it! The bar/restaurant at Xandari is fabulous. They serve breakfast, lunch, and dinner with a variety of local and international dishes. The views from the restaurant are phenomenal, and it’s the perfect place to enjoy a cocktail at sunset. The kitchen can accommodate special diets with advance notice. A la carte breakfast is included. There are lots of activities on-site including botanical gardens, nature trails leading to five waterfalls, a small farm, and swimming in three featured swimming pools. If you prefer wellness and pampering, take advantage of their yoga studio and over-the-top spa! You will be so glad you did. Xandari enjoys a near-perfect temperature of around 70 degrees Fahrenheit all year round, at an elevation of 3900 feet (1200 meters). Swim in one of two 60-foot-long lap pools, or the 125-foot-long sunset pool overlooking the Central Valley. See the Poas Volcano and explore its surroundings, go river rafting, swim through the rainforest canopy, tour a coffee plantation, enjoy a round of golf, tour La Paz Waterfall Gardens and more. Enjoy a massage, mud wrap, facial, and various exotic body treatments with a distinctive Costa Rican flavor at the spa village, set in a tropical garden including private palm-roofed palapas with Jacuzzis and a picturesque view of the Central Valley.